BEVERLY HILLS, Calif. (AP) — Manny Pacquiao is determined to fight on, even without Floyd Mayweather across the ring or HBO in his corner. 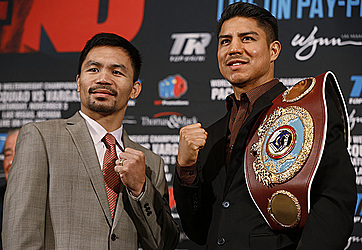 Five months after the fight Pacquiao expected to be his finale, the Filipino senator stood opposite unheralded welterweight champion Jessie Vargas on Thursday and declared his excitement for yet another chapter in what's now a sprawling pugilistic story with a murky ending. Pacquiao is a politician and a father with multiple reasons to walk away, but trainer Freddie Roach believes that Pacquiao's skills haven't sharply declined. Even after repeatedly claiming he would retire into his political career following his win over Timothy Bradley in April, Pacquiao can't deny that fighting is irresistible, both for the competitive rush and the fat paychecks. "It's a big challenge for me to prove I can still manage serving the people and being a boxer," Pacquiao said. "I want to give back to the fans who supported me for all these years." Pacquiao showed up to a packed news conference at the Beverly Hills Hotel, where he has launched all of his recent fights, with a businesslike haircut and a suit befitting a major public figure. 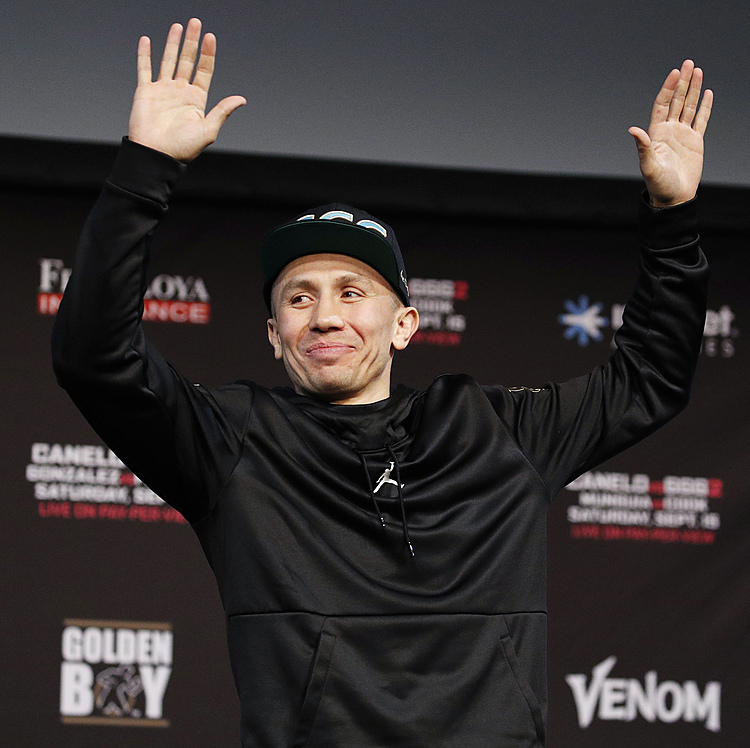 He used his time on the podium to diplomatically encourage fans to buy thousands of $50 seats for Nov. 5 at Las Vegas' Thomas and Mack Center, where he will go after the 27-year-old Vargas' WBO welterweight title. "It's an honor for me to challenge the champion," Pacquiao said. "I respect him because he's the belt-holder at 147 pounds." Pacquiao held the same belt twice for long stretches, but lost it in his landmark showdown with Mayweather last year. Mayweather appears comfortable and financially healthy in retirement, while Pacquiao openly acknowledges he needs the money he'll make fighting Vargas. To Roach, it's fairly simple work — at least simpler than fighting dangerous rising star Terence Crawford, the other finalist for the big-money shot at Pacquiao. "(Vargas) is a good boxer," Roach said. "I don't think he's in Manny's league, but we'll see." Roach must move to Manila for six weeks to train Pacquiao in the breaks between his senatorial duties. Trainers with a fraction of Roach's success might balk at the strange working conditions, but Roach's 15-year bond with Pacquiao remains unbreakable by any of the weirdness in Pacquiao's unique life. "I'm not exactly sure how much time I'm going to have with him, so I'm glad it's Vargas instead of Crawford at this point," Roach said. "We'll fight Crawford down the line later, I'm sure, but I want to see exactly how this works. The Senate is more time-consuming, they tell me." Roach doesn't expect this bout to be Pacquiao's last, either. "Manny still has a good future in boxing, I think," Roach said. "And I really want him to fight Mayweather one more time, just to shut him up. I know we can fight a better fight. I know Manny can beat him." Top Rank promoter Bob Arum never claimed Pacquiao's victory over Bradley would be his final fight. After a half-century in promotion, Arum knows a boxer's vows are only as strong as their wills. Arum's biggest project for this bout is putting on the pay-per-view broadcast himself. HBO declined to show the fight, so Top Rank is producing its own telecast. "It's a historic day, because we're going to take back boxing for the fighters, for the promoters," Arum said. "I really believe this will lead to us forming our own boxing network." Pacquiao has fought 21 times in HBO pay-per-view bouts since 2003, but the network balked at Top Rank's desire to stage the fight three days before the U.S. presidential election and two weeks before Andre Ward faces Sergey Kovalev on HBO pay-per-view. Pacquiao wants to fight on Nov. 5 because it fits his schedule in the Senate, allowing him to keep his promise to closely attend to his government duties in his new job. Vargas watched the Beverly Hills spectacle with a bemused detachment. The matchup is an extraordinary opportunity with little downside for the Mexican-American champion, but he won't be content just to bank his fee for playing a bit part in Pacquiao's saga. "He hasn't ever fought a fighter like me," Vargas said. "He doesn't know what he's got himself into. It's going to be a coming-out party for me, and I'm looking forward to it."